Karl Knechtel: How about a double bent-four situation like this? It seems to me that when one side starts a sequence (by extending to either a, forcing a play at the corresponding b, and replacing the circled stone), that the other corner can provide ko threats for the first fight. If the response to a is the other a (applying mutual damage), then the first player has the choice of capturing four stones and starting a sequence, or capturing a large group and being captured in return (in which case there is nothing more to dispute). What asymmetries can be introduced here? The Japanese rules suggest to me that both "sandwiched" groups die leaving an even result, but is there a way that the first player can do better than that? (Obviously there is no way the second player can do better, because of passing - the same reason that the proper value of komi must be nonnegative.) Suppose one of the "sandwiched" groups contains some extra stones; if the player with the large group is to move, can both groups be beneficially saved? Andre Engels: At least under rules when bent four is dead, there is absolutely no possibility of gaining from playing in this situation. Playing in the left does not gain Black anything: if White does not react, Black has simply lost a point. Playing on the right does not gain anything either - White just captures and has nothing to worry about. This type of position seems to be only interesting in rulesets where dead stones have to be captured. Graham: So what is the ruling for this configuration? I don't think either player will be in a rush to fill the mutual inside liberties, since once these are filled on a group the other player would start the bent four ko and kill the outside group and hence break the whole-board deadlock. So is this seki even under Japanese rules? Juha Nieminen: I came up with this position to demonstrate how it's possible to construct a situation where the "bent four in the corner is dead" rule is unfair. Assume no komi and no prisoners. 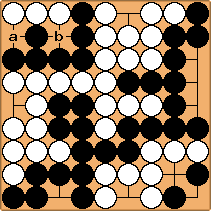 According to the Japanese rules the black group at the upper left is dead and White does not have to demonstrate this. By this rule White wins by 14 points. If White plays the bent four by playing at a in the diagram above, Black captures with b and this sequence follows. Now White has two options: Either ignore black's ko-threat or answer to it. If White answers the threat by playing at c, Black will capture the ko by playing at 2. Now White has no ko-threats, so must pass, after which Black captures by playing at d. The end result is that Black wins by 2 points. If White does not answer the threat but captures by playing at d, Black will capture at e and win the game by 5 points. White could also try to remove the ko-threat with , but Black naturally captures with . Even though now the black group at the upper left is truly dead, Black still wins by 5 points. If we considered the situation at the upper left corner a seki, Black would win by 2 points. Thus there's absolutely no way White could win this by playing. The Japanese rules may be anomalous but it's not unfair. It applies to both players and they know about it before they start the game. Isn't the standard way to show it is anomalous just to position a double ko elsewhere on the board? aLegendWai: It is because W cannot activate the ko itself. It is the B privilege to activate ko or not. But even that, it is just seki, why say bent 4 in the corner is dead? The second point is that B can fill up all ko threats and come back to kill W group at anytime. So W group is unconditionally dead. Got it? Mef: There is some fine print here, and that is if white has an unremovable ko threat. In those rare instances white may be able to save the group. TDerz Not only unremovable ko threats as explained above question that Bent4 is unconditionally dead. I am sure that someone on this page will already have mentioned that removing all ko threats will cost points and may thus lose the game! Chris Hayashida: Not quite. Under Japanese rules, after both players pass, a player needs only to show that the group can be captured to prove its dead status. After that, the points are counted from the original position. So filling all possible ko threats (after both players have passed, and the game has ended) only count as a "what-if" and do not count against the player filling the ko threats. aLegendWai: That's me again. :P I have highlighted my bits to remind the reader of not doing so. 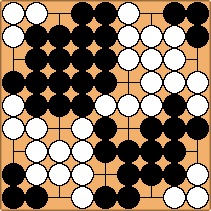 Who can put a link here to the famous Go Seigen game where he refused to connect a (normal) ko for the reason of having an excess of ko threats (normal, not double ko or so)? Warp: The page says: "Under Chinese rules or under rulesets where life and death have to be proven rather than simply decided, the ko should be played, because unremovable ko threats can make a difference." Ok, this is a milder version of what people usually say, which is something along the lines of "in other rulesets the situation has to be played out", but it's still perhaps a bit too drastic. The "it has to be played out" claim made by many is simply not true in the majority of cases. Granted, there are some cases where this is true, ie. it has to be played out, but these cases are rather rare. In most cases playing it out would only be a waste of everyone's time, and the owner of the bent-four group could just as well admit that the group is dead, period (ie. when there are no unremovable ko-threats on the board, which is rather usual). It sometimes has to be played out, but usually it would be useless. The milder "should be played" is also a bit misleading. It gives the impression that it should be played in any case, regardless of the situation. Again, if there are clearly no unremovable ko-threats playing it out would be a waste of time (the invader would just have to make dozens and dozens of moves to protect every single ko-threat and then use half a dozen of moves to explicitly capture the group; if area scoring is used this doesn't affect the score and thus is just a waste of time). It's the same as with basically any other dead group: Forcing your opponent to explicitly capture them is just a waste of everyone's time. Perhaps a better expression would be something along the lines of "in area scoring rulesets and rulesets using pass stones" (or something like that) "the ko may have to be played out explicitly if there are unremovable ko-threats elsewhere on the board". Perhaps also "however, if there are none, then the group can just be considered dead". 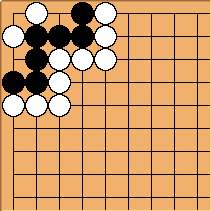 My interpretation: Under Japanese rules, the white group is dead because white can do nothing to force the ko. In this case, white looses sixteen points. I am unclear about how the Chinese rules are applied… Is the white group alive in seki if black does not activate the ko? RobertJasiek: "under Japanese rules" is an invalid expression here because there are several such rulesets and they differ from each other, especially with respect to application to bent-4. Under Chinese rules, in terms of these rules, there are no sekis! Therefore you may not speak as if there were. There are, however, "vacant points situated between both sides living stones". How to apply Chinese rules? §21: "[...] After both sides have agreed to end the game, if any unsettled postions remain on the board, both sides' stones in these positions are treated as alive. Any disagreements must be settled by further actual play." So if you disagree, play it out, i.e. continue with the alternation until you are satisfied with it, i.e. until you will have removed all opposing stones that you want to be removed! Anyway, the more I think about the Japanese rule, the more unfair/unreasonable I think it is. The essense of a ko is that there is a certain cost involved in settling it, thus winning a ko always involves a trade-of of sorts. (In this case, the minimum cost would involve black having to remove his ko threats before the end of the game) This rule creates a certain class of ko which are settled automatically without any cost to the winner. In the given example, this is not only unfair to white, it is contrary to reason! Xanthus: I do not agree entirely with saying that you have to accept the cost of removing as winner if it is totally dead. That is like saying you should actually take dead groups off the board, even though it costs points (with territory scoring of course). I'm not suggesting black should have to explicitly capture white's stones; white is totally dead if and when black converts the ko. I'm talking about the trade-off you have to make when you win a ko fight... If there are ko threats, you generally have to give something up to win -- except, of course, in this case, when black gets a freebe! Even if there are no unremovable threats, black should at least be forced to bear the cost of removing some of his threats. If this turns out not to be profitable, he need not initiate the ko. Dieter: Not at all it is ignored in real life. Some time ago a Chinese participant in the Belgian Championship was very surprised to find out we play with this rule. He asked his opponent ot play out the situation or agree there were no points there, then consulted the referee. As I am starting to see the benefits of stone counting in teaching Go to beginners, I am very much in favour of changing the rules in our country. Bent four is just another argument, valid for stronger players and referees. What a Pandora's box! I am new to GO, and was attracted to the game by its sublime simplicity. I assume from the tone of this discussion, that Japanese rules are used in the US and Europe(?). Mef: I can't speak for Europe (though it sounds like the Belgian Championship used Japanese), but as for other places, New Zealand's rules deal with this just like Chinese. The US tries to get around this by using their own rules (see AGA Rules), and KGS lets you choose any of those 4 rulesets. unkx80: Comments originally from "bent five in the corner". Note that "bent five" is a non-standard term, we typically use "bent four" instead. This shape becomes, with one more play by white, a Bent four in the corner. It is therefore considered dead in Japanese rules Bent four in the corner is dead. However, in actual play, black can turn a Bent four in the corner into a Ko fight. It is only considered dead after two passes because there are no (non local) ko threats at that point under Japanese rules. This in turn is often considered to be unfair by newcomers, although acceptable since, if black wants to fight the ko, black should simply start the ko. It would be worse to insist that white plays an extra stone into his or her own territory. 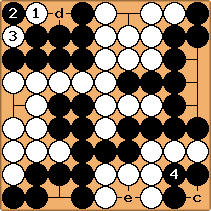 With this shape, however, black cannot 'begin' the ko fight for life. Any move black makes here will result in black dying. Even so, white cannot actually kill without going through a bent four and hence allowing a ko fight to be initiated. It is almost like seki, except that rather than black-plays-black-dies, white-plays-white-dies it is black-plays-black-dies, white-plays-ko-fight. Obviously none of this applies to Chinese rules, where the two players can simply fight it out and extra stones in their own territory are irrelevant. Squint? : In the presence of Unremovable ko threats it seems very unfair that black dies in a situation where white would not actually be able to kill (because white would loose the ko fight trying). It is unfair to require white to play, and unfair on black not to, and the strongest argument I know for preferring Chinese rules over Japanese rules. Andy: "unfair" is not quite the right word to describe the Japanese rules. Presumably both players are aware of the rule at the start of the game, and the difference in likelihood between black vs white forming the shape is small. You could argue the Japanese rule is "inconsistent" with the other rules, but not that it is "unfair".